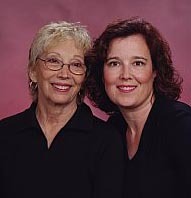 We are a mother-daughter team of REALTORS. We created this site as a reference for our buyers, to be bookmarked and returned to as the buying process unfolds. On these pages we have done our best to answer all of your very important questions regarding your purchase of a home in Arizona. We have selected the most informative sites we could find to make your exploration more enjoyable and eventually to make your transition to our Valley of the Sun an easy one. Have fun and get familiar with our valley, its communities, schools, recreation facilities and amenities. Find the answers here that will make you and your family more comfortable with your move. We have a large section dealing with the actual purchase of your home, and even copies of the paperwork you will encounter. Hopefully we will have answered your questions. If not, just email us your question or call on our toll free and we will find the answer for you. We have packed the pages full of information for you. We begin with Our Team. The Communities page will link you to each of the cities and towns in the Valley of the Sun and give you an opportunity to learn about the areas. If you have a family and are interested in Schools and School Districts please be sure to check out these very helpful pages. Choosing a place to live is not just about the school district, the floor plan and how short your commute to work is; it is also about the things you do in your off time. Living in Arizona will share with you how much there is to do here in the Valley of the Sun. We add fun things to this page as we come across them. For some of you Golfing is living and we understand. Be sure to spend some time at Before You Buy. This page will answer many of your real estate questions. We have a few documents every buyer should read from the Arizona Department of Real Estate, we have information for when you are ready to move into your new home and so much more. This page is an important resource for you. In fact part of your real estate contract to purchase your new home will require that we have made some of these pages available to you.